My daughter absolutely loves YouTube, and most nights she will tune in to her favourite you-tubers and catch up on their latest videos. Therefore, when I spotted an online advertisement for the Digital Kids Show that also happened to coincide with her birthday weekend, I knew that we would have to visit, and make sure that she would have a day to remember. The show itself was being held at Event City in Manchester which is located adjacent to the Trafford Centre. As we live in North Wales, we had to do a bit of planning to get there as my husband and son needed the car on the same day and so our journey ended up involving two trains and a bus, and took nearly 3 hours in total to get there, but I made sure that I had all the timings written down and so despite being a bit nervous about catching the wrong train, it all turned out to be relatively easy and we got there and back without any issues. In terms of my own opinion, I paid £21.59 each for tickets including booking fee. I was happy with this price, as I feel it is the average price for a day out per person. The price paid included all attractions, and shows inside the event and so it was nice to know that there would be no extra charges whilst attending. The only extra thing I would have liked to have seen in regards to the tickets, would have been a family ticket option, but I believe from speaking to staff at the event that this is something that they will be looking to do in the future. The event was due to start at 10am, however we did not arrive until just after 10:30am which meant that we missed the queue to get in, and simply walked straight in on arrival. Brochures were available to purchase at a cost of £2 per person. I did hear a few people grumble about having to pay extra for this, but this is standard practice at most events, and I was more than happy to pay the additional £2 given that at some events we have had to spend an extra £10 on brochures alone only to find them just full of advertising, therefore I felt that £2 was very reasonable and it certainly wasn't forced on you to purchase this. Maps were also provided free of charge, so if anything the brochure was simply a nice memento of the day with some fun facts about all the you-tubers inside and it wasn't something that you HAD to purchase. Unfortunately this was the only actual "Digital Kids Show" merchandise available for sale, and I would have liked the opportunity to have purchased tshirts/hats/keyrings etc as my daughter often likes to buy memories of our day out. 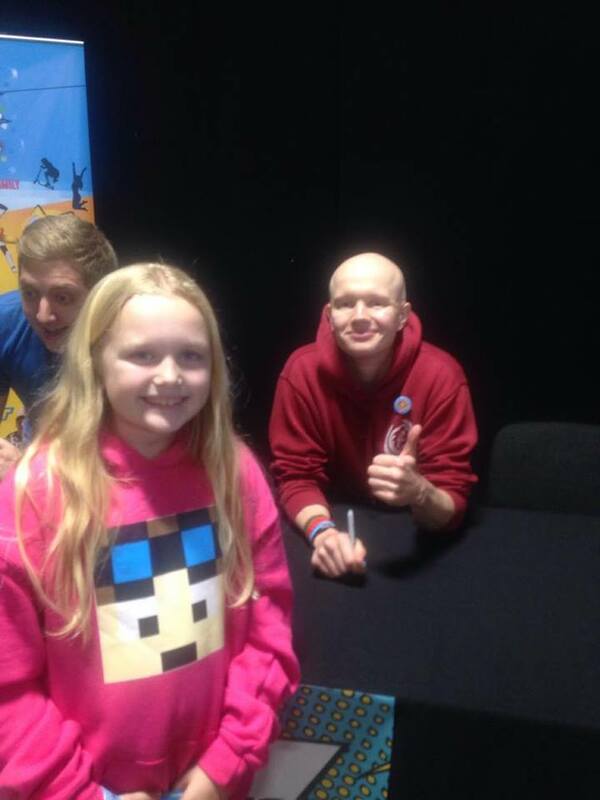 However, there was some individual youtubers merchandise available such as EthanGamerTV tshirts and hoodies, Ashdubh tops, and Amy Lee books and all of these were very reasonably priced. I was very impressed with the Amy Lee book which at only £5 for a large hardback book, had plenty inside to keep my daughter interested and was of a really good quality. Once we were inside and brochure purchased, we checked out the plan for the day, and worked out all our timings so we knew where we had to be and when. The first show was due to start at 11am, and so we headed straight over to the seating area to get good seats. Boogie Storm were the opening act, and despite there being a few issues with the sound system they put on a great show to start the event. 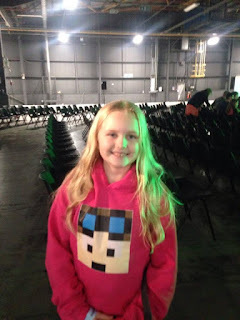 Following this was the YouTube Q&A session, though my daughter only opted to watch part of this, as she cleverly realised that whilst everyone else was watching the show, it meant that she could try out the other attractions without much of a wait. We headed over to the total wipeout zone, where she had great fun playing on "The Sweeper" she went on this a couple of times, waiting no longer than 5 minutes for each go, and then she spotted a VR headset stand a short distance away and so she went on this and played minecraft for about ten minutes. 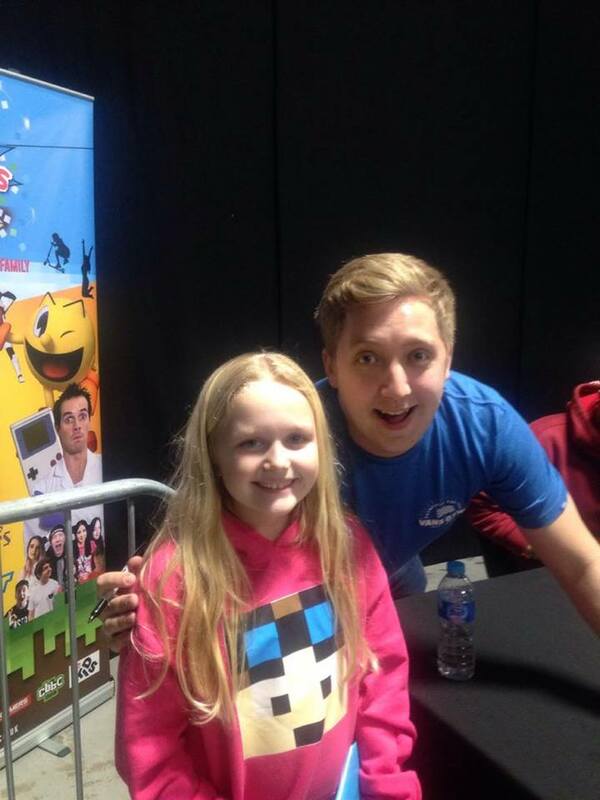 This then took us to just before noon, and the meet and greet was due to start at 12:45 so we headed straight over to the queue for AshDubh, Tomohawk and Inthelittlewood. 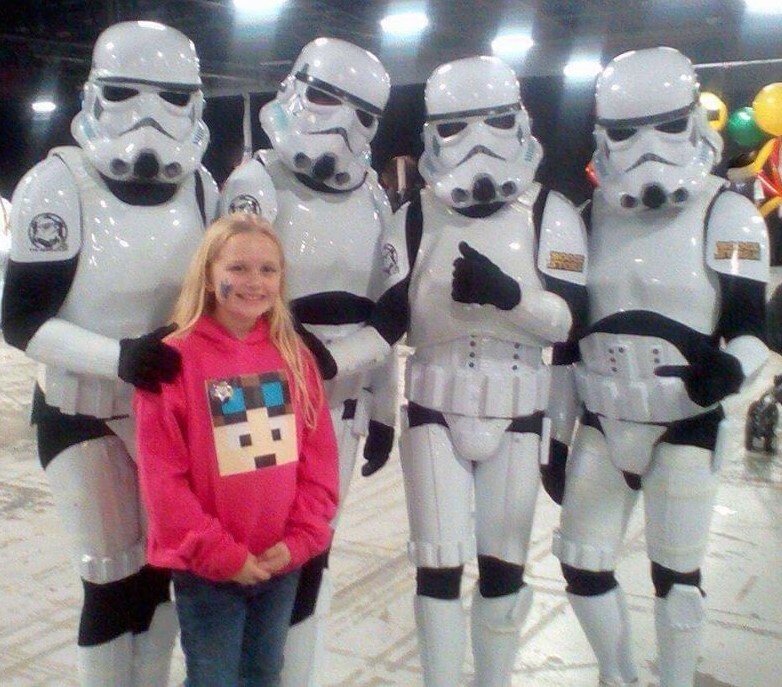 In doing this, it meant that we would only have a 45 minute wait and we were only 3rd in the queue, so my daughter was more than excited about being so close to meeting Ashdubh (There were other queues available for the other YouTube stars). I had expected to queue, so the queuing really wasn't an issue for us, and I've always found when attending events like this, that queuing is just part and parcel of it. Also if you make the effort to talk to the people around you then this can make the time go so much quicker. It was lovely getting to know some of the others in the queue and finding out where they had travelled from. I thought we had done a bit of a trek from Wales, but the lady next to me had driven all the way from Essex and was just as excited about meeting Ashdubh as her son! Brilliant! When the moment came to meet the YouTubers, AshDubh actually came over slightly earlier and walked the line. He couldn't have been any nicer and took the time to speak to everyone, pose for photos and much to my daughters delight he even wished her a Happy Birthday and wrote it on the back cover of her brochure. She was absolutely over the moon with this, and said that she thought she was going to faint. 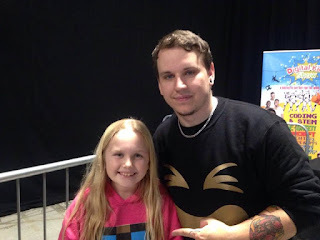 My daughters dream birthday present was to meet AshDubh, and being able to witness the happiness on her face when not only did she meet him, but he also made the effort to chat with her and wish her a happy birthday, absolutely made her day and mine. 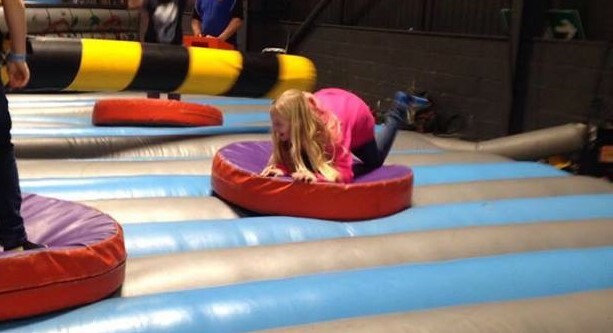 This was really the only thing that she had 100% wanted to do at the show and so the rest was just a bonus. We then continued to queue to meet Tomohawk and InTheLittlewood who came and sat down about 10 minutes later, and they were just as nice. Once our meet and greet had taken place we decided to have a good look around with the intention of heading back to join the queue for the Amy Lee book signing towards the end. We checked out all the trade stands, visited the Alopecia and Dog's Trust Stands and then had a look around some of the game stands such as Scalextric and Beasts of Balance. 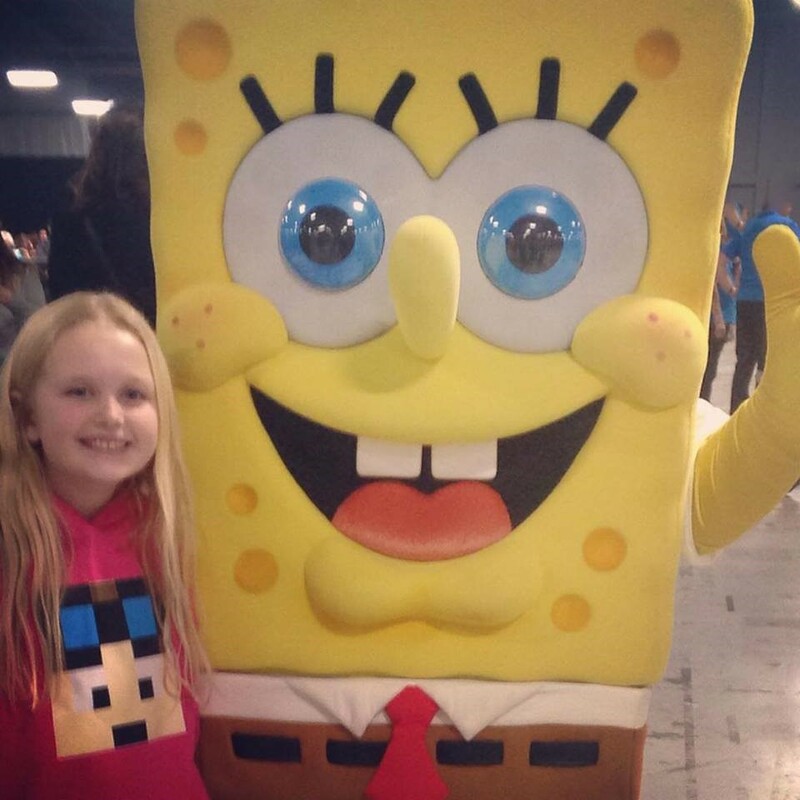 My daughter enjoyed visiting the PopJam stand and designed a phone case. She loves art and so it was nice to also have a few art & craft stalls. We were starting to get hungry by this point, so decided to tuck into some sausage rolls & drinks we had bought from Greggs earlier. Unfortunately the shows caterers had been changed at the last minute by the venue and so the organisers had put out a message on Facebook and via email the night before stating that you could bring your own food. Our lunch cost £5.60 and we sat on one of the hay bales around the craft area to eat our food. There were plenty of bins dotted around so we didn't need to worry about disposing of our packaging. After lunch my daughter continued to visit the various other stands around the venue. We may have just been lucky with timing but for most areas the queues moved fast and we rarely waited longer than 10 minutes. Excluded from this was the Young Driver Experience which seemed to have a lengthy queue the whole time we were there, but I can understand why this was so popular. I spoke to a couple of people in the queue and the average wait time for this seemed to be 45 minutes to an hour. Still far less than you would queue at other attractions in the UK though and worth it for a unique experience of driving at a young age. As we wanted to head back to the book signing, we decided not to join the queue, but this was my daughters decision and she was still more than happy with everything that she had tried so far. Once we had reached the queue for the book signing again, it was much larger that when we had left. We were due to leave at 2:45pm which at this point gave us just over an hour so we joined the queue, again happy to wait as the meet and greets had always been the main draw of the attraction for my daughter. As we were queuing a lady came over and explained that she was really sorry but they were going to have to cut the queue off as they had not yet even had a break, my daughter said that she understood and although it was shame as she had wanted her book signed for her birthday she didn't want them to go without a break. The lady suggested that we went and enjoyed the rest of the attractions and to pop over again just as we were leaving to see if there was any chance of being an add on just before we left. 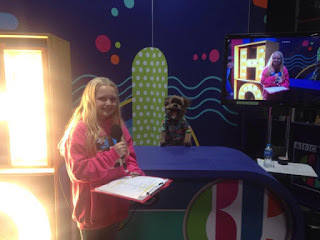 We took her advice, and headed off to the CBBC area where my daughter enjoyed a CBBC presenting experience with Hacker. She absolutely loved this, and had previously took part in a presenting workshop in London with Ben Shires and Katy last year prior to the Children's Bafta Awards, and so to have the chance to stand in a replica of the CBBC studio in front of the camera was fantastic, and definitely an added bonus that she hadn't been expecting. Following this, she made some speakers for her phone in the Blue Peter zone and was given some cards of the presenters. This was almost the end of our experience at the Digital Kids Show, so we made sure we had all our things and made our way towards the exit. The meet and greet area was by the exit, and so we found the lady we had spoken to previously and tried our luck to see if we could quickly get our book signed before we left. 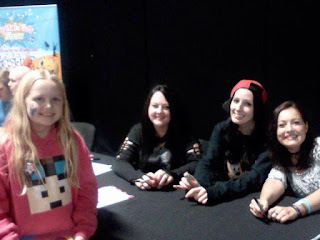 Despite having being signing for nearly 4 hours at this point, Amy Lee was more than happy to oblige and due to being sat with NettyPlays and SalemsLady they also all signed her book and wished her a Happy Birthday too. I then left as an extremely happy parent of one very happy daughter whose birthday day out had been everything she had hoped it would be. Overall we had a fantastic day out, it was exactly how I had expected it to be, and I believe that the event offered great value for money. Being the very first day of the event, which is also in its first year, there were of course some minor teething problems, but the promoters know this, they know what worked and what didn't and I am sure that next year it will be back even bigger and better. 1) Make the most of the space: Whilst there was plenty to see and do, there was also still plenty of space that could have been filled with even more which would have helped to have reduce the queues in other areas. 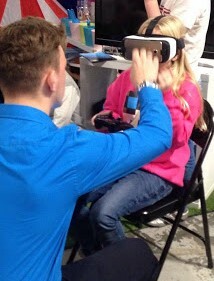 More tech/gaming stalls for example Playstation, Nintendo, Drones etc. 2) Free Wifi: This is probably more to do with the venue than the promoters, but it was frustrating to not be able to share pictures, videos, check in etc until after we had left due to there being no wifi available and limited signal indoors. 3) Charging points: There were so many photo opportunities that this quickly killed my battery and my phone was flat by lunchtime. It would have been great to have just been able to charge my phone for 20 minutes whilst my daughter enjoyed one of the attractions. For a first time event I think that it was great and the positives of the event far outweighed any of the negatives. Yes there are some small improvements to be made if this is to be held again in future years, but the main draw of the show was the ability to meet and greet your favourite youtubers, and this is exactly what they delivered. Both my daughter and I would definitely return. *Disclaimer - I purchased tickets to this event and chose to write this review of my own accord.